You probably find it hard to think of situations where this "invisible store" would be useful. So let's consider some company for example. It has a number of departments. There are employees in each department. 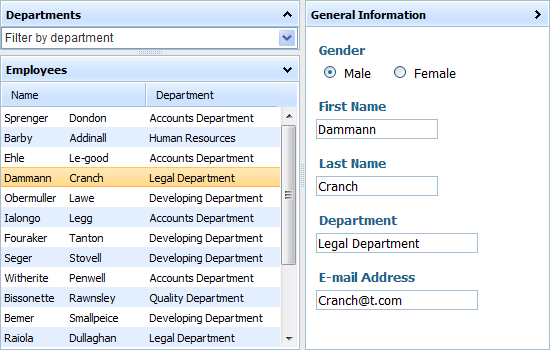 Some element that allows filtering staff by department. Details of the selected employee. Clearly, we need several components to achieve our goal. dhtmlxlayout - allows grouping elements on a page. As you can see, we've needed just 4 commands to load data and link the components (steps 3 and 4) that proves the above-mentioned statement: dhtmlXDataStore is really a handy way to store data when dealing with several components. If you deal with a grid (bind it to smth or smth to it) and the grid (or bound-to-it component) doesn't display anything, check if you call mygrid.setColumnIds('field_1,field_2,field_3'), where field_1,field_2,field_3 are the names of the related data items of the bound component.